Tens of thousands of children across Pennsylvania are leading multi-million-dollar fundraising efforts to support pediatric cancer research. 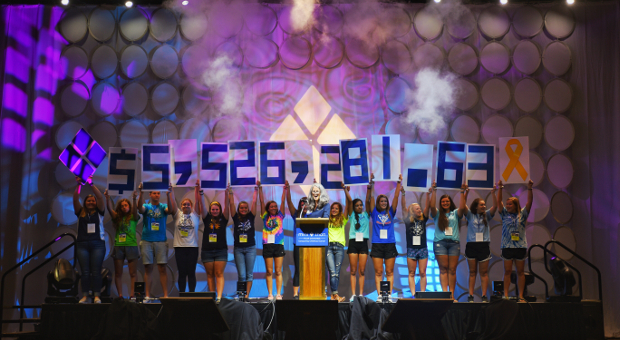 More than 70,000 student volunteers in 235 schools across five states teamed up to raise $5,526,281.63 to fight childhood cancer through Four Diamonds Mini-THONs during the 2015-2016 school year, a $1.3 million increase from the previous year. The announcement was made this morning at the Mini-THON Leadership Summit. Mini-THONs are modeled after Penn State IFC/Panhellenic Dance Marathon, or THONTM, the world&apos;s largest student-run charity. This new wave of philanthropy has raised more than $23 million since 1993. The money is used to drive the discovery of new and improved treatments for childhood cancer, through funding more than 70 pediatric cancer research team members at Penn State College of Medicine; and to ensure that every child is treated for cancer at Penn State Children&apos;s Hospital without any out-of-pocket costs for their families. The Mini-THON Leadership Summit brought together more than 700 high school and middle school student leaders and nearly 200 advisors to share best practices, celebrate successes and inspire each other to continue the fight as they organize Mini-THON events for the coming year. For more information about Mini-THON visit http://www.fourdiamonds.org/mini-thon.